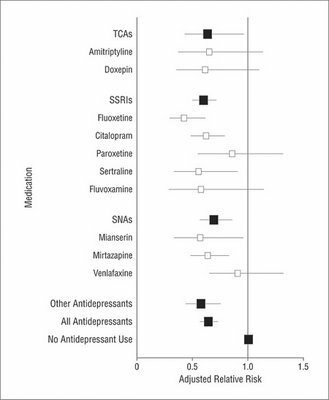 Okay, my gut says that the everyone with Major Depression (and therefore a chance of relapse) got put on meds, so the increased risk of suicide was due to a relapse in illness, not an effect of the meds. Maybe, not really, because these folks looked at who actually was taking the meds at the time of attempts subsequent to the index event (the initial hospitalized attempt that got folks into the study), so the risk of ATTEMPTING suicide is lower if either 1) you weren't prescribed meds or 2) you were prescribed 'em but didn't fill your prescription. 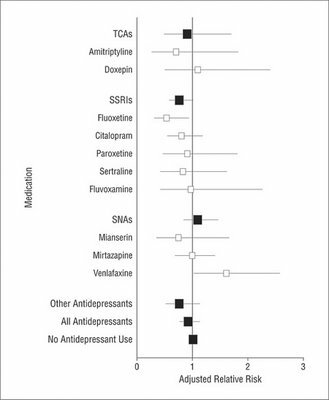 My guess is that some people stop the meds because they are no longer depressed, and those still taking the meds are more likely to be people who feel badly; this is all very complicated. Nothing about this study says the SSRI's CAUSE suicidal behavior. 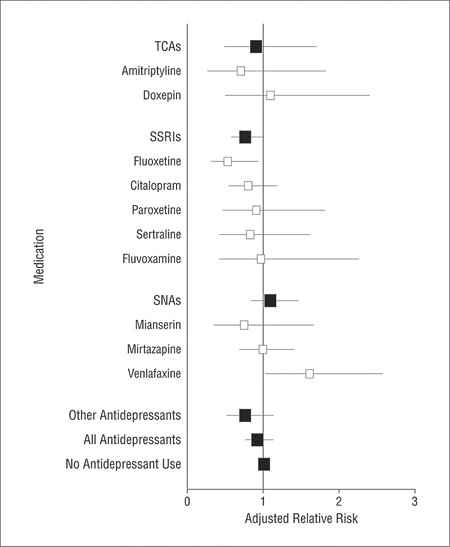 And nothing about this study says SSRI's don't cause sucidal behavior. And why did they look at so many meds but not Bupropion??? (Wellbutrin). Good luck today, Roy. Fill us in. Very very nicely done. Thanks, Roy. 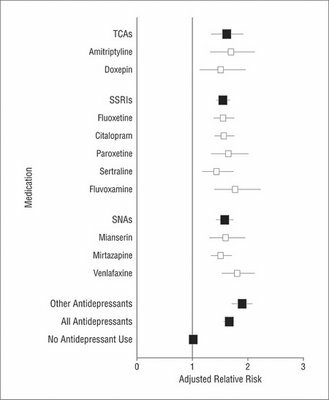 Interesting in that fluoxetine is looked at as Mr. Bad of the SRIs. The data may reflect that it is easy to get the dose right for efficacy so that the (disturbing side effect)/efficacy ratio gives the drug an overall good outcome. 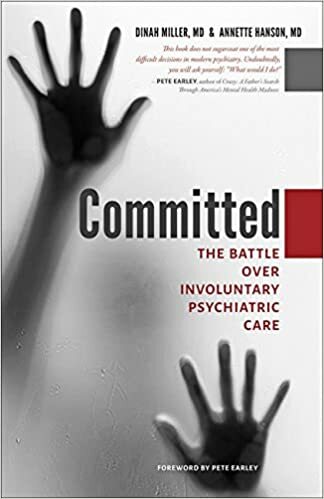 The society has kind of a boderline personality attitude toward drugs, overidealization potentially followed by denigration which doesn't aknowledge that the hypothesized illness treated is not benign. For Effexor the problem is that, though it can be just the drug, if it doesn't work, it should be stopped because it is like a tca in overdose. Hi Michael & welcome as a Shrink Rap commenter. Interestingly, fluoxetine is the only med proven to work in childhood depression (sorry, no ref, I may have heard it in Grand Rounds--not blog, real life academic center). Clinically, I believe meds should be pushed to either their maximum tolerated &/or safe dose, held their for 6-8 weeks, and if they aren't clearly working, stopped. If they are helping, but the patient remains symptomatic, they should be augmented. Patients shouldn't be kept indefinately on meds that aren't helping them, and sometimes this does get lost in the polypharmacy laundry we've come to depend on. Heh, thanks Dinah. I've used 'michael' or my blog name depending on what kind of hurry-defaults of the comment system come up. Happy to see about the revisions to the labeling. As I commented in more detail in 'Dr. Helen' when she had a recent blogpost on adolescent suicide, there is evidence that the original warning was really due to the admistrative power of Joe Barton (R-Tx) who was head of the committe that determined funding at the FDA. I can repeat myself here if anybody is all that interested. Of course, this, in my view, political event is misunderstood by 'Seabear,' cf. 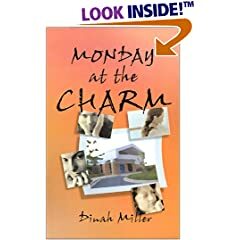 another recent post in Shrink Rap, and others. That wasn't hard was it. Connect through the link J' Accuse Congressman Barton, pardon my French here, remarks in English at 7:12 PM in the Comments.